Eurofighter Typhoon VS Dassault Rafale: Comparison using Latest 2012 Figures; What India Gained and What it Missed. Dassualt Rafale and Eurofighter Typhoon, two state of the art combat aricrafts were competing against each other not in a battle sky, but on papers. India had declared the requirement of 126 MRCA as a replacement for its ageing combat fleet for which Eurofighter Typhoon and Rafale along with other aircrafts ( Swedish Saab Gripen, Eurofighter Typhoon, French Dassault Rafale, Russian Mikoyan MiG-35, and the American F-16IN and F/A-18IN) Super Hornet were competing. Along with Indian Air Force’s technical requirement, another major criteria was also the cost, including the acquirement cost, production cost, operation and maintenance cost. India is already struggling maintaining its fleet due to high operation and maintenance costs. The cost issue is not only in the military, but also in the civilian side. Although Defence aviation industry functions quite differently than Civil aviation industry, today flights to Sydney from India costs nearly the same as the cost of standard Air India flight from New Delhi to Bangalore on a busy day. Out of six competitors, Rafale and Eurofighter Typhoon had made up to the final round, Dassualt Rafale being the lowest bidder winning the deal [Read: Dassualt Rafale Wins 126 MMRCA Jet Fighters Deal With India]. It would be the first sale of Rafale outside France once the deal is finalized. Officials here said that the representatives of Dassualt Aviation have been informed of the results and development and soon talks could be held for further negotiation on the price of the aircraft. Now that a new Aircraft will join the Indian fleet very soon, there is a big curiosity all over the world about how much India gained or missed choosing Rafale over Eurofighter. The Eurofighter Typhoon, designed by a consortium (Eurofighter GmbH, formed in 1986) of three companies: EADS, Alenia Aeronautica and BAE Systems, is a twin-engine, canard-delta wing, multirole fighter. In 1971, the UK had issued a requirement for a new fighter jet. According to the specifications issued by the Air Force, a new conventional ‘tailed’ design was formed known as P.96. Although the design was on par with the requirements, UK’s air industry felt that it did not appear disparate to McDonnell Douglas F/A-18 Hornet. By that time F/A-18 was already in the advanced stages of the designing, and the UK industry believed by the time their aircraft will be ready, F/A-18 would have already captured major markets. Meanwhile, West Germany was also in the race to design a fighter jet. It was in 1979 when Messerschmitt-Bölkow-Blohm (MBB – Germany) and British Aerospace (BAe – UK) jointly presented a formal proposal to their respective governments for the ECF (the European Collaborative Fighter) or European Combat Fighter [Source: Buttler 1990, p. 134]. In the very same year, French major manufacturer Dassault joined the ECF team in October 1979, bringing the concept of Eurofighter. The initial idea was that each country would individually present their design of the aircraft and the best one will be selected to go with. France produced the ACX. The UK produced two designs; the P.106 was a single-engined “lightweight” fighter, superficially resembling the JAS 39 Gripen, the P.110 was a twin-engined fighter. The P.106 concept was rejected by the RAF, on the grounds that it had “half the effectiveness of the two-engined aircraft at two thirds of the cost” [Source: Boot 1990, pp. 229–233]. West Germany continued to refine the TFK-90 concept. However, the project collapsed just after two years in 1981 because of various technical and political reasons. Each country had different requirements. Also, French insistence on leadership in the design phase and UK’s stipulation for their RB199 engine to power the aircraft instead of French Snecma M88 kept the project from running [Source: Butler 2000, p. 135]. As the project collapsed, the requirement for a new aircraft was still on high priority; as a result, in April 1982, the Panavia partners (MBB -Germany, BAe – the UK and Aeritalia – Italy) launched the Agile Combat Aircraft (ACA) programme [Source: Buttler 2000, p. 137.]. Although, it was a joint project, the British dominance could be easily seen in the ACA project, as the design was very similar to the BAe P.110, having a cranked delta wing, canards and a twin tail. One major external difference was the replacement of the side mounted engine intakes with a chin intake. The ACA was also to be powered by a modified version of the British RB199. Such a dominance by the UK resulted into the recantation of The German and Italian governments funding. In 1983 Germany, France, UK, Italy and Spain launched the Future European Fighter Aircraft (FEFA) programme. The aircraft was to have short take off and landing (STOL) and beyond visual range (BVR) capabilities. In 1984, France reiterated its requirement for a carrier-capable version and again demanded a leading role. The West Germany, UK and Italy opted out and established a new EFA program. In Turin, on 2 August 1985, West Germany, UK and Italy agreed to go ahead with the Eurofighter; and confirmed that France, along with Spain, had chosen not to proceed as a member of the project [Source: Lewis, Paul. “3 European Countries Plan Jet Fighter Project.” The New York Times, 3 August 1985, p. 31]. Despite pressure from France, Spain rejoined the Eurofighter project in early September 1985 [Source: Eurofighter: Spain joins the club.” The Economist, 17 September 1985, p. 68.] France officially withdrew from the project to pursue its own ACX project, which was to become the Dassault Rafale. By September 1985, foundation of Eurofighter and Rafale had been laid and France and other European countries went on their ways to prove their technical leadership and making their version as successful. Today, both the aircrafts are reality out of the paper. While Eurofighter has already made its way into Austrian, German, Italian, Saudi Arabian, Spanish and United Kingdom’s Airforce, Rafale has shown its capability in Libyan war last year. But the most high profile battle which they fought was in the files of Indian selectors and at Aero India 2007 Airshow in Bangalore. Shortlisting of both the aircrafts to the final round had toughened the rivalry between France and European nations even more. The European nations got their biggest blow when the got the news of Dassualt Rafale grabbing the deal with India. France, blamed for being over confident, dominating and demanding, was pushed out of the joint development of Eurofighter. And the same France had defeated the European group with its version of the design, which it was proposing then. While it was the moment of rejoice for France, leaders of the UK, Germany and Italy were deeply hurt and indicated that they would talk to Indian government to convince them to have a re-look at Eurofighter. So far the Indian government’s decision has remained unchanged. This would be the first sale of Dassualt Rafale outside India, which is considered to be one of the biggest defence deal in the world. Figures and Comparison according to official data from Austrian Air force, Eurofighter.com and French Navy. India has had good strategic relations with French Dassault Aviation. Dassault has provided the aircrafts as well as the technology to manufacture at home, in India. India has already tested the capability of Dassault Mirage 2000 in Kargil war. Indian pilots and manufacturing companies are familiar with Dassault products and hence not many efforts will be required for pilot training and setting up of the assembly and manufacturing line when compared to a totally different platform of aircraft. The place where Typhoon clearly beats the Rafale is the thrust. Dassault has not given any reason why such a less powerful engine is used for a 4+ generation fighter, though the company has maintained that it is working to replace the current engine with the more powerful one. However, Thrust to weight ratio of both the planes are similar and Rafael has more capacity of take off load. The Rafale is much more fuel efficient, but the EJ200 retains its power in high mach numbers, giving the Typhoon superior acceleration post Mach 1.5. Even though the M88s can function in limited airflow at high altitudes, they loose some of their punch, which limits the Rafale to speeds of Mach 1.8-1.9, while the Typhoon can go well past Mach 2. If an Air Force is buying MMRCA in this decade, after so much spending and thinking, then it must be AESA ready. 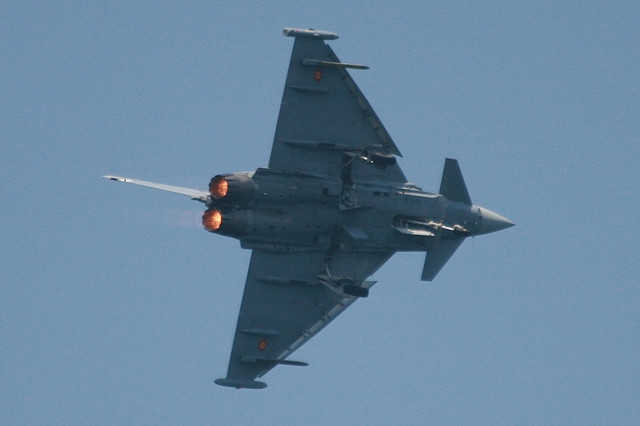 In this case Rafale is already AESA ready and will be equipped with the AESA radar this summer [Source: First Rafale To Be Equipped With AESA This Summer], whereas Eurofighter Typhoon might not see AESA radar before 2015 [Source: Eurofighter Typhoon to fly with AESA radar by 2015]. Also India may expect Rafale delivery sooner than Eurofighter Typhoon, since Rafale is not gone for export yet. Typhoon already has lots of pending orders from export and consortium customers. Some unconfirmed sources are also indicating that Rafale has offered India fourty fighters in fast track mode for early delivery. The former Red Arrows team leader – Peter Collins – stated Rafale as a “war-fighter par excellence”. He added that he deemed the Rafale to be the best and most complete combat aircraft that he had ever flown. He concluded in saying that if he had to go into combat, on any mission, against anyone, he would, without question, choose the Rafale. Some analyst also believe that these aircrafts may not be compared as they belong to different categories, Typhoon is air superiority fighter with limited multi-role capabilities, whereas Rafale is a true multi-role aircraft.